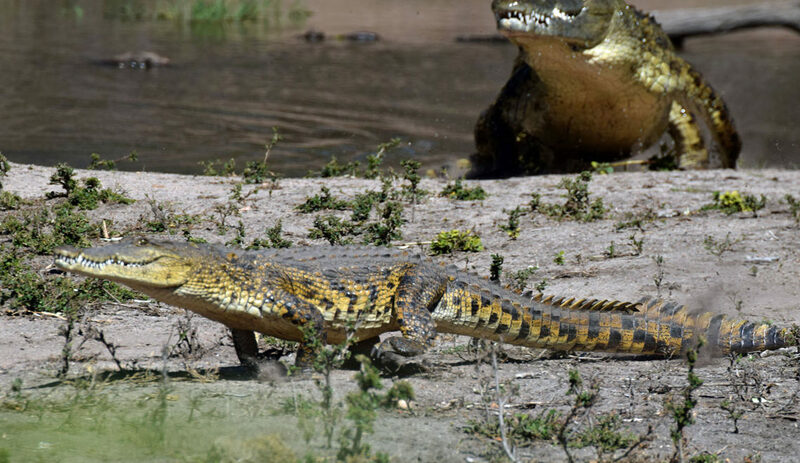 Train your eyes on the surface of a river, lake or dam in the north and east of Limpopo province or northern KwaZulu-Natal, and you may well see the beady eyes of a “river horse” staring back at you. 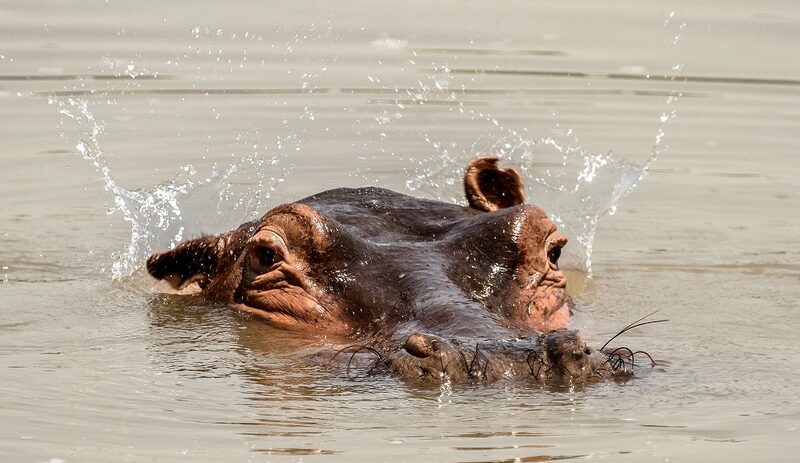 Named by the ancient Egyptians, the “hippo” (meaning horse) “potamous” (meaning river) is one of the continent’s largest land mammals – third only to elephants and rhinos. They live to be an average of 40 years old. 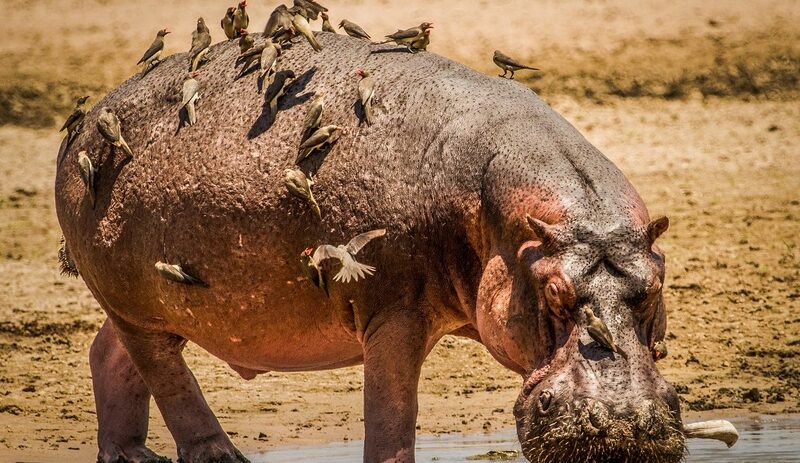 Their babies are notoriously cute but don’t let hippos’ roley-poley waddling demeanour fool you: after mosquitos, these herbivores are responsible for the most deaths in Africa – more than the number of deaths attributed to elephants, buffalo and rhinos combined. The skin of the hippo can weigh half a ton: it’s nearly hairless and very thick. To cool off, the large mammals spend about 16 hours submerged under water or covered in mud. They also secrete an oily red substance from their skin – but it’s not blood, contrary to popular belief. The red substance moistens the skin, acts as a natural sunblock, and may also provide protection against germs or act as a healing agent. Adult hippos can hold their breath underwater for up to six minutes and typically walk along the bottom of a river or lake rather than swim. Babies, meanwhile can only last about 30 seconds – but they do have an incredible ability to suckle underwater by closing their ears and nostrils. Hippo milk is pink. Yes, pink! And a single cup contains more than 2,000 kiloJoules. 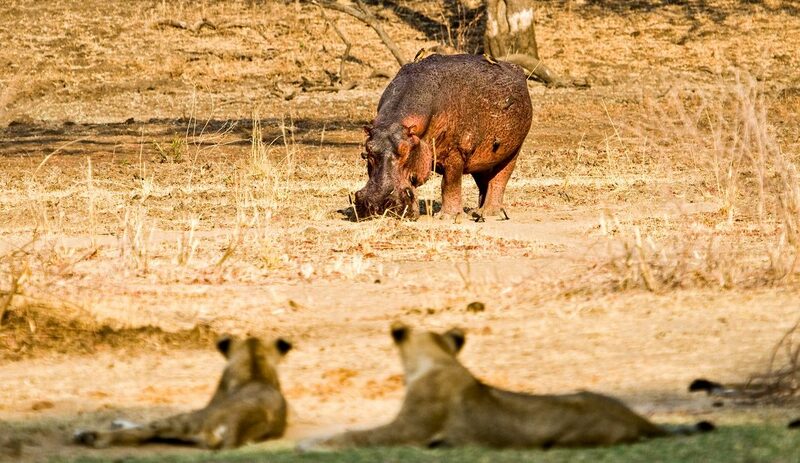 Considering their massive size, they’re not really “hungry, hungry hippos”: travelling overland to graze at sunset, the animals can walk many kilometres along single-file pathways until they’ve eaten their fill of about 35 kilograms of grass. 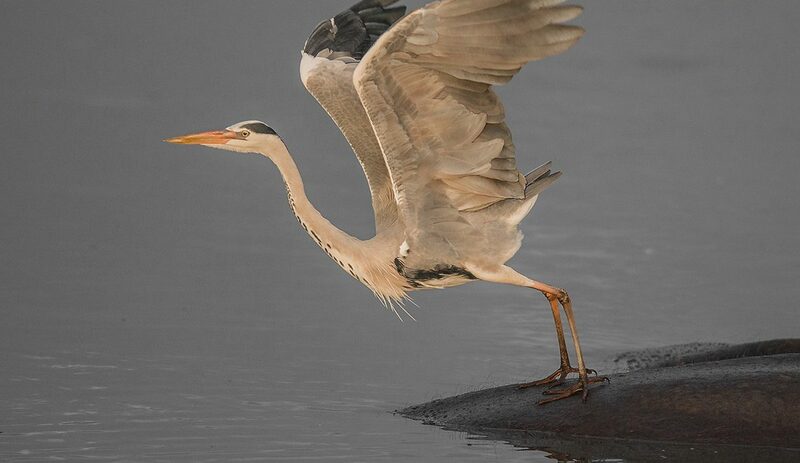 They exit and enter the water at the same spot and are very territorial. You won’t want to stumble upon a hippo while they’re feeding on land, as it’s one of the times they’re most dangerous to humans. They may be hefty (weighing in between 2,000 and 3,600 kilograms), but hippos are agile! 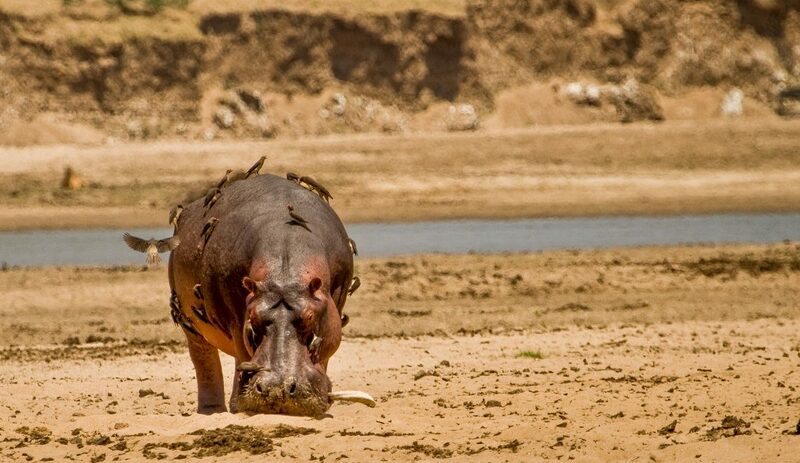 If threatened on land, hippos will run for the water and can reach speeds of up to 30km/h in short bursts. 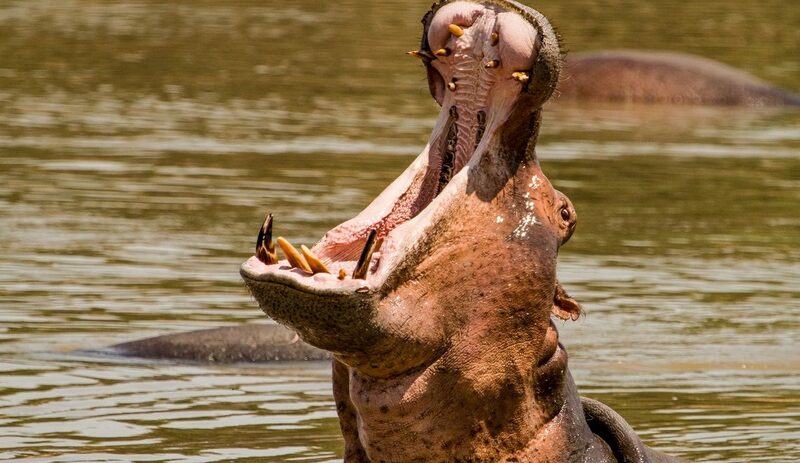 The yawn of a hippo doesn’t mean it’s tired: it’s a territorial gesture that warns you not to come any closer to its massive canine teeth (which can grow up to 30 centimetres long). Its jaws can snap closed with the bite force of a ton! Each female (called a cow) has only one calf every two years. Gestation lasts eight months. Soon after birth, mother and young join pods that provide some protection against crocodiles, lions, and hyenas. Dominant male hippos (called bulls) look after schools of between 10 and 40 other hippos (both male and female). 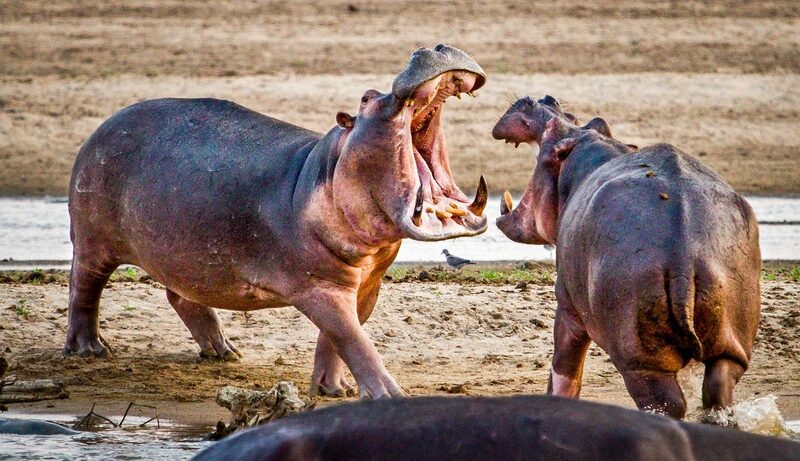 Hippos are listed as “vulnerable” on the International Union for Conservation of Nature and Natural Resources’ Red List due to poaching for their meat and tusk-like teeth, as well as loss of habitat. They’ve also historically been killed in areas where they damage agriculture or pose a threat to human settlement. 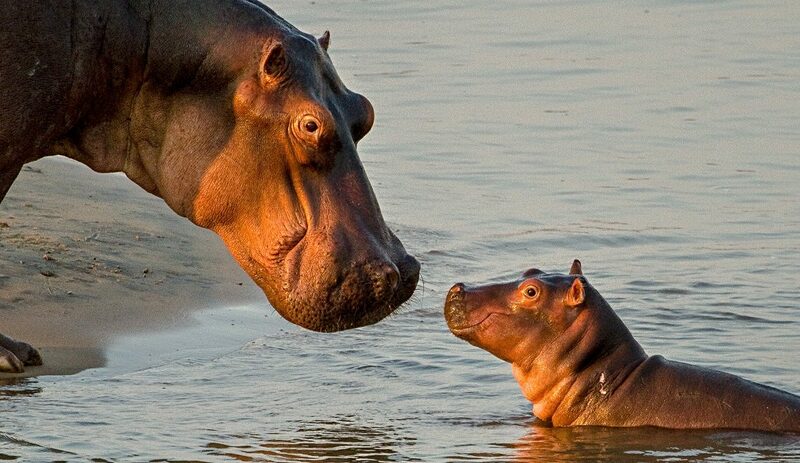 According to the Wildlife Conservation Society, there are an estimated 125,000 to 150,000 common hippos left in Africa. This represents a decline of as much as 20 percent during just the last decade. The hippo’s closest living relatives in the animal world are cetaceans such as whales and porpoises.